When I heard that they were renovating Norris, I got so excited. To be honest, I couldn’t care less about the design of it – I just wanted to know what new restaurants they were going to bring in. The old restaurants were (how do I put it…) disappointing. I almost exclusively ate in Allison dining hall last year because the Norris restaurants never appealed to me. With the exception of maybe Subway, they were all pretty bland and low-quality. Earlier this week, I got hungry for some lunch after class and I didn’t feel like waiting in the long dining hall lines, so I decided to walk to Norris and check out the new places. I opted to try the Budlong Hot Chicken because I’d seen so many people walking around with the boxes and the smell was inviting. I was a little skeptical because having hot chicken outside of Nashville – and especially on campus – seems just as unnatural as having a Philly cheesesteak outside of Philly. I will say my skepticism was very misguided. I ordered the Budlong hot chicken sandwich – classic style, with everything on it – and fries on the side. The first thing I noticed was the sheer size of the sandwich. It was big enough to be a meal by itself but I wanted to try the fries because I’m known to judge a place by its fries. I finished most of my meal because I hate wasting food, but the portion size was a bit too much for me. All of that aside, the actual flavor of the sandwich was amazing. A sizeable piece of chicken, farmslaw (their version of coleslaw), pickles and Budlong sauce all sit between a warm and soft brioche bun. The chicken is crispy and the classic heat level is only slightly spicy, which makes it perfect for people that are not into extra spicy food. I judge spicy food by how much it makes my nose run and the classic level only gave me a slightly runny nose , so it’s nothing too serious. You can also order your chicken naked, hot or extra hot and I’m looking forward to trying to up the spice level the next time I go. The farmslaw adds a cooling factor to the sandwich, which becomes more important the spicier you order. It doesn’t have too much dressing so you can still taste the vegetables and they maintain their crunch. Normally I’m not a huge fan of pickles, but I’ve been told that you have to have them with Nashville hot chicken and I was pleasantly surprised by how well they worked on this sandwich. You get several really thick and sweet pickle slices that also help to cut through the spice of the chicken. 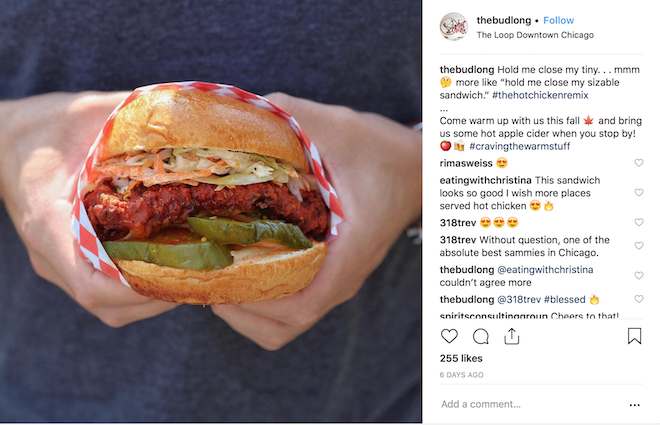 I couldn’t distinguish the flavor of the Budlong sauce from the rest of the sandwich, although it may have been combined with the flavor of the slaw. All of these ingredients come together to make a truly complex tasting experience. Additionally, the thick-cut fries are a complimentary side because they are twice-fried (making them extra crispy) and are seasoned with salt and pepper. All of the food is served piping hot in a timely manner and it is conveniently packaged for a student on the go. The staff is friendly and helpful if you can’t decide what to order. The only problem I have with Budlong are the prices. The sandwich is $11 and the fries are $3. So, without getting a drink, you’ve already spent $15.40 with tax, which is probably not ideal for the average college student. If you use dining dollars, you at least get to save some money by not paying tax, but if you eat in Norris often, that can really start to add up. Overall, I’m pleased that this is one of the new restaurants that we have on campus. I can’t wait to go back and try more things on the menu (I’m most excited about the banana pudding.) I’ve had Nashville hot chicken a couple of times before and I am by no means an expert, but I do know what a delicious meal tastes like and this is a delicious meal. While the owner is from Chicago, he developed his recipe based on the hot chicken he had while visiting Nashville. It justified me breaking my rule about eating signature dishes outside of the city they were popularized in. If you’re ever wandering around campus thinking about what you’re going to eat for lunch or dinner, consider stopping by the Budlong Hot Chicken to get a taste of non-Chicago cuisine.